In 1941, two very important things happened that even the best historians would be hard-pressed to mention when questioned about the history of World War II. The first was the founding of the United Service Organizations. The second was the beginning of what would turn into an enduring partnership between the USO and The Coca-Cola Company. Charged with bolstering the spirits and morale of young GIs, often far from home for the first time, the USO had a big job to do as U.S. involvement in World War II became more likely by the day. When the boys ended up on foreign shores in early 1942, the need to keep them connected to the things they missed including family, home, country—and Coca-Cola—was even greater. Coca-Cola president Robert W. Woodruff understood the importance of the mission and made it clear his company was behind the nation’s service members, making a declaration that would end up costing the company more than $83.2 million in today’s dollars. That directive, as the Coke employees refer to it today, laid the groundwork for expansion of bottling sites around military installations like Camp Pendleton, California, and Fort Benning, Georgia. As the country prepared for the inevitable, the once sleepy bases were suddenly teeming with soldiers, sailors and Marines training for war. Coke had always been available to the military, but as the U.S. war machine ramped up, so did the need to provide GIs everywhere with a touch of home. Certainly Coke was critical to that mission—so critical that the company wasn’t subject to the same sugar rationing as the public—but the refreshing soft drink couldn’t do the job alone. The company also worked with Milton Bradley, the board game manufacturer, to create special versions of popular games specifically for the USO. There also were specially branded sewing kits, one version for each of the three services—the Air Force was established after the war, in September 1947. And of course, the ice-cold beverages. Neither could accomplish the mission of bringing a taste of home to GIs alone. They merged “to help the spirits of the troops,” Ryan said. “We did it through the USO. 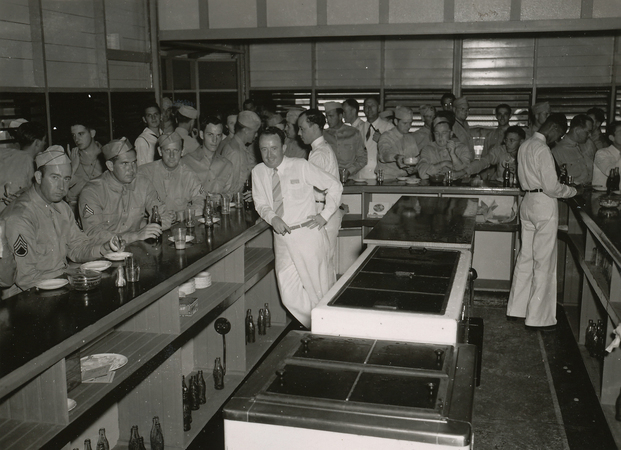 [Coke and the other items] were put into the centers and made available to troops wherever they were. “Wherever the USO is, Coke is, as well. And we’re making life easier,” he added. And “wherever” was no exaggeration. Fast forward to 1943 and the “Eisenhower cable” requesting equipment to construct 10 Coca-Cola bottling plants plus 3 million bottles of Coke and enough materials to produce that quantity twice monthly. “We call it the Eisenhower cable, but it was actually General [George C.] Marshall—Eisenhower’s boss—who sent the cable,” Ryan said. “Woodruff did one better. We built 64 bottling plants around the world at our own expense to support the war. To make this project a success, Coke sent more than 200 employees to build and maintain the plants and get the product to the GIs. These individuals, three of whom were killed in the line of duty, were civilians but wore military uniforms and the rank of technical observer, making it easier for them to do their jobs without interference. The bottling plants were mostly in Europe and North Africa, as well as a sizeable operation in the Philippines. But that didn’t mean the GIs in the Pacific theater went without their favorite beverage. “We created the jungle dispenser, which was a special dispenser that cooled without the use of too much ice so the Coke would still be cold,” Ryan said. Coca-Cola continued to ensure its soft drink was available to occupation forces even after the war was officially over. 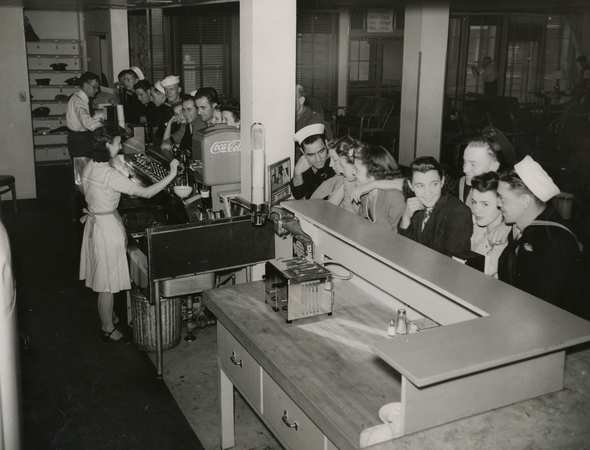 Between 1943 and about 1949, service members in the field consumed more than 5 billion Cokes—a number that doesn’t include drinks consumed stateside. In late 1947, President Harry S. Truman gave the USO an honorable discharge, saying in a statement the organization had “fulfilled its commitment and discharged its wartime responsibility completely and with signal distinction.” With World War II fading in the glare of a jumpstarted U.S. economy, few Americans thought the country would be fighting across the ocean again in the 1950s. With the Korean War came the realization the USO was needed—permanently. Again, Coca-Cola was there to help the organization support our warfighters, though the support for Korea and Vietnam centered more on product than on games and ancillary items, Ryan said. “Because World War II was an era of total war, the entire U.S. economy focused on the war,” he said. “Whereas—for good or ill—Korea and Vietnam weren’t the same, in that sense. There were playing cards and pens and the like, but it wasn’t the “all-encompassing” effort to provide the many distractions—board games and the other supplies—like during World War II. Despite public sentiment about Vietnam and the Coca-Cola’s potential for loss if it went against consumer opinion, the company’s support might have surprised some. But that’s not how Woodruff, or his company worked. “It would have been so anti-Woodruff,” Ryan said. “I think it’s in our DNA. We have a heritage of help going back. Whenever there’s a natural disaster, Coke is there. Whenever bad happens, Coke is there to help people. 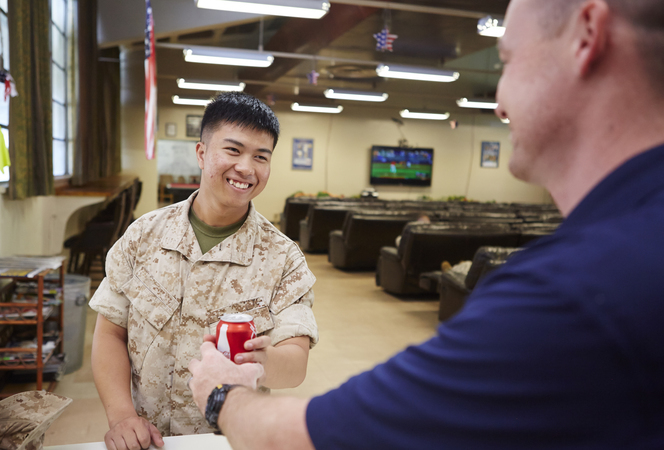 Von Heiland Strader has helped revitalize the Coke-USO partnership with multiple campaigns and engagement opportunities each year. In the recent past, The USO has enjoyed being a part of events like the Coca-Cola 600 at North Carolina’s Charlotte Motor Speedway, and just as true to today’s “GIs” as those from World War II, Korea and Vietnam, Coca-Cola is still a staple at USO centers around the world. As the USO celebrates its 75th anniversary, and The Coca-Cola Company marks its 130th, we raise our glasses—filled with Coke, of course—to our oldest partner. Here’s to another 75! —Samantha L. Quigley is editor in chief of On Patrol magazine. This story appears in the Spring 2016 issue of On Patrol, the magazine of the USO. USO centers have served and supported military members and their families for the past 75 years. But among the more than 180 USO locations around the world, two of the newest were built specifically to address the needs of wounded, ill and injured service members and their caregivers.